It was January 22, 1973, and I sat in a front row desk of my American Civics class as a junior in high school. It was the day of the landmark Supreme Court decision to make elective abortion legal in all 50 states. My instructor invited students to express their opinions on the court’s decision. I listened to my fellow classmates, but I remained silent. 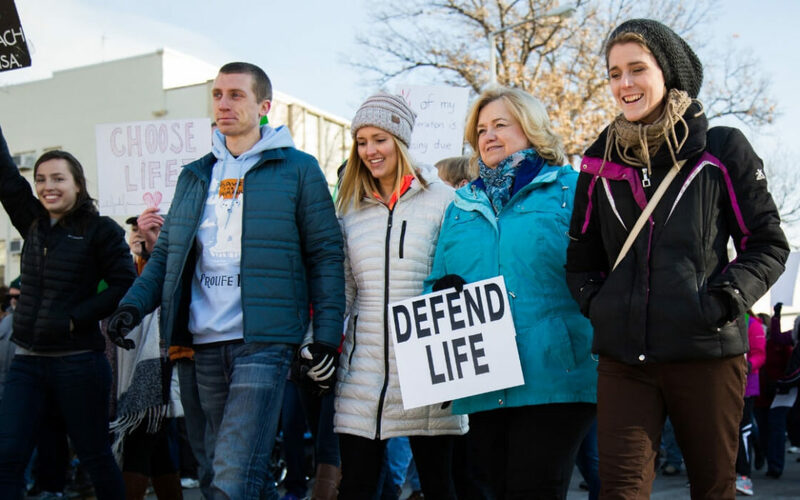 I march every year with the Walk for Life because it reminds me of their courageous stories. During this difficult time, Lizzy confided in me. We talked. We cried. We prayed together. I encouraged her to choose adoption, but sadly, she chose to end the life of the little one inside her womb. Twenty years later our paths crossed at our class reunion. She told me that something died in her soul the day she aborted her baby and that she wished she had carried the pregnancy to term. She regretted her abortion. Once again, we talked. We cried. We prayed together for her to know the love and forgiveness that God freely gives. I march for the grieving women who suffer in silence. I march for Lizzy. Through tears, Will shared his story with me. He and his college sweetheart found themselves pregnant in 1986. Against his wishes, his girlfriend went to a Planned Parenthood and had an abortion. Will didn’t get a choice when it came to the little boy his girlfriend carried within her womb. Will thinks about his son often. He wonders what he would be doing today. To soften the pain, he chooses to educate others with the message that fathers also grieve the loss of children from abortion. I march for grieving fathers who were not given a voice to protect their children. I march for Will. In 2011, I attended Silent No More, a presentation by women who regret their abortions and have experienced the forgiveness, love, and healing that God provides. There, I heard Alice share her story. As a teenager, Alice viewed abortion as a form of birth control. During her third abortion, she experienced excruciating pain. Her uterus was perforated during the procedure and she was transported by ambulance to the hospital. To stop the hemorrhaging, an emergency hysterectomy was required. I march for the women who will never have children or grandchildren due to abortion complications. I march for Alice. Toni is a dear friend of mine and her story is different than the others. She leads a pregnancy resource center. She and her team come alongside women and men who find themselves in an unplanned pregnancy. Without a single government dollar, they offer free ultrasounds, counseling, baby clothes and supplies, parenting classes, adoption resources, and perhaps most importantly, a non-judgmental listening ear. Toni and the many others working with pregnancy resource centers across the country are equipping men and women to make life-affirming decisions. I march for those working directly with women and men in hopeless situations and providing hope. I march for Toni. This list is not complete without including the 60 MILLION babies that have been aborted since January 22, 1973. The same day that I sat in a classroom of peers and we debated the Roe v. Wade U.S. Supreme Court decision. These innocent ones were never given a name, but I march for them. These gatherings celebrate the culture of life. The infinite value of the unborn, the life inside the womb of uniquely formed fingers and toes and beautiful heartbeats beginning on day one! It has been forty-six years since the Roe v Wade decision. A vibrant Pro-Life movement has emerged because we are Pro-Woman, Pro-Science and Pro-Baby. We celebrate that each unborn child is uniquely created from day one! Join thousands of Nebraskans this Saturday, January 26th at the North Side of the State Capitol at 10 a.m. Elected leaders will speak briefly, prayers will be offered before we march to the Student Union to hear the powerful testimony of Catherine Adair, a former Planned Parenthood employee who found hope and healing and mother of five. Click here for more details. This is the Pro-Life Movement. This is Why We March.